Rei of Light Jewelry Designs, based in Encinitas California, offers an eclectic mix of beautifully handcrafted jewelry comprised of unique gemstones, crystals and earth elements. We have a beautiful way to raise awareness about food allergies and support FAACT. Rei of Light Jewelry Designs has created a unique jewelry collection which represents food allergy awareness. The Empowerment Collection offers an elegant yet simplistic necklace and sparkling earrings of teal quartz crystal designed for everyday wear. All of the jewelry in the Empowerment Collection is available in sterling silver and gold filled chain and wire. Designer Brenda McDermott, who has a passion for making healing jewelry, explains that quartz crystal provides protection to the wearer along with healing properties to fortify and strengthen all systems of the body. 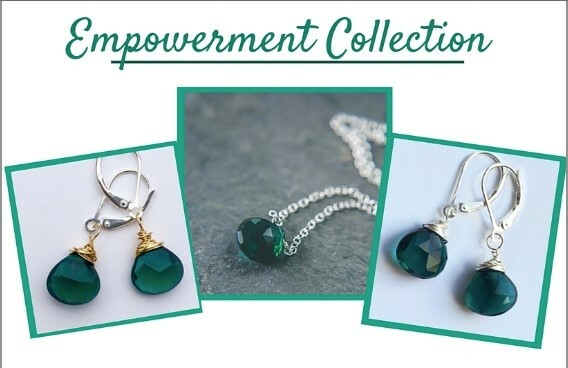 Order your “Empowerment” jewelry today from Rei of Light Jewelry Designs and 25 percent of the proceeds from this original piece will go directly to FAACT. Wear it proudly to show your support or give it as a unique and restorative gift. Visit Rei of Light Jewelry Designs Web site and place your order today! Brenda believes in the healing properties of crystals and gemstones which instills her passion for creating beautiful, one-of-a-kind pieces of jewelry. It is her hope that each Empowerment Necklace brings joy, positive light and protection to the wearer and that she can infuse a source of healing and positive light into our organization. Her passion for educating and supporting those with food allergies is a perfect fit for our mission and objectives. From childhood Brenda suffered from various ailments not knowing they were food allergy related. Everything from asthma, allergies, sinus problems, GI issues, sleep disturbance, skin problems, joint pain, and the list goes on. She didn’t discover until her late 30's that she had severe gluten and dairy intolerances. In conjunction with changing her diet, she found significant healing through the use of crystals. Brenda has made it her mission to mentor others going through the process of changing their diet and environment.